Raffles Institution has the programming to ensure that your talents are developed to the optimum. Starting form Year One, we offer the Euler Programme, a Mathematics Talent Development Programme where students can expect to be exposed to a most challenging curriculum with accelerated, rigorous and advanced content. In RI, you can be a part of the leading team that has clinched all major mathematics competitions in recent years including the prestigious Singapore Mathematics Olympiad. Apart from competitions, there are also extensive enrichment programmes that we offer in order to cater to the needs of all students. Besides the rigorous academic programme, the all encompassing curriculum offers a myriad of programmes to develop the person into a Thinker, Leader and Pioneer. The Rafflesian Experience will put you in a good position to excel and become leaders in the fast changing world. We hope that you will be part of our tradition of excellence that has lead us to the fore since 1823. To provide an advanced and enriched curriculum that is intellectually challenging to the young talented minds, The Euler Programme is a Mathematics talent development programme that is established for students in Years 1 and 2 who have demonstrated exceptional ability in the subject. 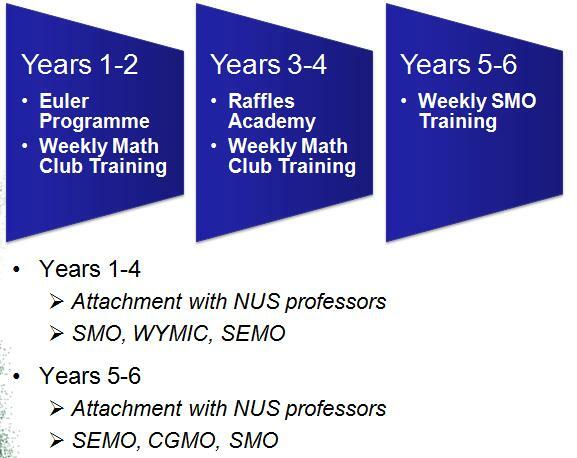 In the programme, students can expect to be exposed to a most challenging curriculum with accelerated, rigorous and advanced content, leading on to the Raffles Academy for Mathematics for Years 3 – 6. In addition, students are expected to participate in intense and exciting competition training, research and immersion programmes. Provides a unique approach to learning that is problem-centred, inquiry-based and integrative with an emphasis on rigorous mathematical proofs. Provides mathematically talented students a chance to cover advanced content not usually covered in secondary mathematics curriculum (including interesting topics covered in university). Provides students an opportunity to do a research project in pure or applied mathematics at an advanced level. They may also be attached to universities to be mentored by professors (both local and overseas) or other research institutes such as DSO during vacations. Provides opportunities to participate in well-known Mathematics Competitions like the Singapore Mathematics Olympiads and the World Youth Inter-city Mathematics Competition. to bring out the full potential in pupils. Activities of the Club include weekly training sessions to prepare students for Mathematics Competitions including the American Mathematics Competition, Australian Mathematics Competition and the Singapore Mathematics Olympiads. Other activities include the annual Maths Club Camp. Members also produce yearly publication (Maths Plus) containing interesting Mathematics articles.